Today we have Katherine from Neon Yeti Reads sharing her review of Hamlet by William Shakespeare! Hamlet is one of my favorite plays – and quite possibly was my favorite play to teach. I once wrote a scholarly essay titled, “Mother May I” all about the relationship between Hamlet and his mother! Good times! Take it away, Katherine! P.S. Don’t forget to head on over to a Rafflecopter giveaway to enter for a chance to win a Shakespeare retelling of your choice!! For me, Hamlet was always the Shakespeare play I stayed away from for the longest time. It’s the longest of all of Shakespeare’s plays and probably the most intimidating because of that. However, earlier this year, I decided that I would finally pick up this play with the handy guide of No Fear Shakespeare and plenty of notes to help me along with reading it. I am so thankful that I did by the end of it though! My favorite aspect of Hamlet is that there are so many different layers to our main character, Hamlet. After the death of his father and seeing the Ghost appear to him with a message of revenge, he starts slowly going crazier and crazier. I really loved the internal conflict in his character about whether or not he was acting crazy or if he was actually, mentally insane. I struggled with trying to figure out my own opinion throughout the book, and I went back and forth. Some of my favorite scenes included the moments when Hamlet was with his royal family, acting strange every time, but a little different type of strange as well. There was so much royal drama – it felt like this time period’s version of a political drama. Another aspect of Hamlet I enjoyed were the minor characters – people like Ophelia and the Queen. Both girls were very interesting characters, especially considering the historical context of the play and when it was written. There is a little bit of dialogue about the relationship of the British Crown to the people; the little underlying themes of palace drama was really interesting. When everything starts going down in the last two scenes, everything gets really creepy and I could not stop reading! Everyone has their own ulterior motives and it’s all about figuring out who is up to what. Of course – the language of Shakespearean time takes a little bit of getting used to. In the past experience I have had reading Shakespeare plays, I have tried to read them in large chunks so I can stay involved in the language of the play. 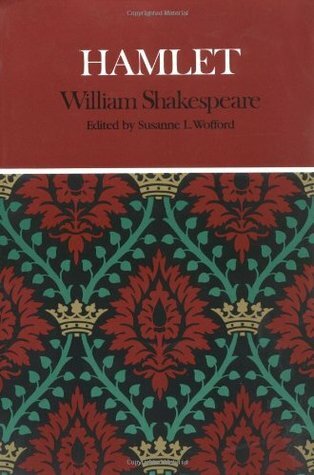 While I wasn’t able to do that with this one, I really liked the footnotes and annotations both from No Fear Shakespeare and in the edition of my book. Overall, I really enjoyed this play! I think that it really added so much to my Shakespeare reading experiences so far and I love the way that he is able to tie in so many underlying themes. It is a classic tale with so many themes that have been used in all of literature. It really shows how much influence Shakespeare has had across all genres and I am quite happy with how Hamlet turned out! P.S. The movie version of Hamlet starring David Tennant was really good, so I would suggest watching that to help understand the play while reading! It adds a whole new dimension to the story. This entry was posted in Event and tagged author, Authors, Bard on the Blogs, Hamlet, plays, review, Shakespeare, tragedy, William Shakespeare. Bookmark the permalink. ← Bard on the Blogs: Shakespeare Inspired Gifts! What a great review of Hamlet! I haven’t read it in aaaages, but now I kind of want to revisit it as an adult. Glad you wound up enjoying it!